Club Z! Tutoring of Orange County, NY, proudly serving families in Warwick, Florida, Goshen, Washingtonville, Monroe, Cornwall, Highland Mills, Chester, Newburgh and Middletown, is celebrating its official grand opening with special offers, including free SAT or ACT test preparation services. Local families are encouraged to like and follow the Club Z! Tutoring of Orange County Facebook page @orangecountytutors to participate in all of its grand opening special offers and promotions, or call (845) 378-1448 to register. 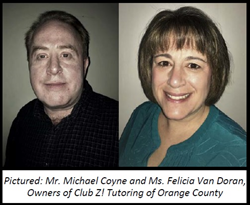 We know that Orange County parents will be extremely happy with the quality of services offered by Club Z!, and the truly unique educational experience we can offer their children. Club Z! Tutoring of Orange County, NY, proudly serving families in Warwick, Florida, Goshen, Washingtonville, Monroe, Cornwall, Highland Mills, Chester, Newburgh and Middletown, is celebrating its official grand opening with special offers, including free SAT or ACT test preparation services. Local families are encouraged to like and follow the Club Z! Tutoring of Orange County Facebook page to participate in all of its grand opening special offers and promotions, or call (845) 378-1448 to register. Club Z! Tutoring of Orange County offers in-home and online tutoring for all subjects, including SAT and ACT test preparation and study skills development. In addition, Club Z! Tutoring of Orange County has services and programs to support students of all ages, from Kindergarten readiness through college admissions counseling. Club Z! services are also available year-round, with everything from test prep classes to summer reading camps available during the summer months. To celebrate its official grand opening, Club Z! Tutoring of Orange County is offering local families free SAT and ACT test prep services, including diagnostic testing and 30 days of access to their extremely popular Z Prep! Score Booster study program, now through July 31, 2018. The Score Booster study program offers in-depth diagnostic results, detailing a student’s specific strengths and weaknesses on the SAT or ACT exam, as well as answer explanation videos from top test prep tutors demonstrating the correct way to solve each and every test question. It has proven to be a real game-changer for college-bound students aiming to improve their test scores, and local families can see for themselves what the buzz is all about now through the end of the promotional period. Families are encouraged to like and follow Club Z! of Orange County @orangecountytutors or call (845) 378-1448 to take advantage of the free test prep, as well as all of the other exciting grand opening promotions.